The Charter Oaks townhome community was built in 3 phases between 1972 and 1975, and consists of 101 units on a verdant, green campus. I’m told that the builder was the highly regarded Blackwell Homes. 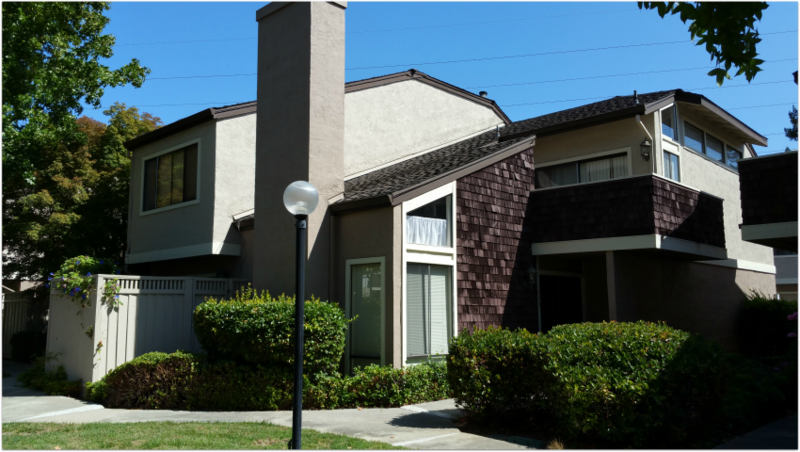 Each townhome enjoys between 960 square feet and 1,760 sf, with the average being 1452. Most are 2 story but there are a few single story homes as well. Lot sizes are small (1,920-3,205 SF, average is 2477 SF) as there is a great deal of common, outdoors space to enjoy. Los Gatans are drawn to Charter Oaks for many reasons. First, it offers well built homes that are thoughtfully designed in a beautiful setting. The community features include expansive greenbelt areas and a pool. The location is a huge plus. It is located alongside the Los Gatos Creek Trail, making it an easy walking or bike commute to Netflix, a simple bike ride to Vasona or downtown Los Gatos, or a convenient route for a longer ride, jog, or stroll. 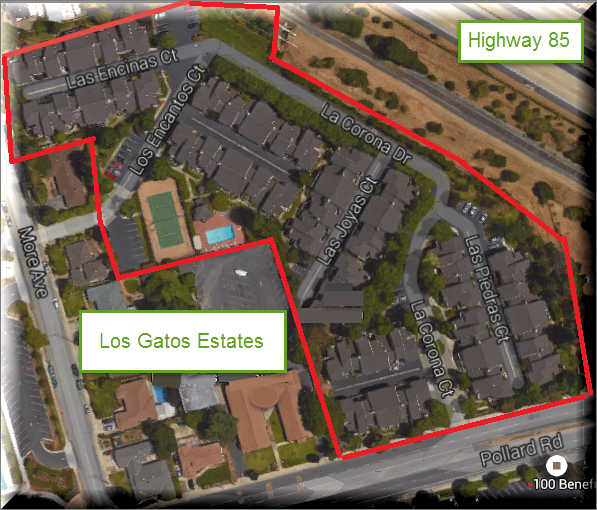 To top it off, this area includes the highly regarded Los Gatos Schools and is close enough to the freeways to make commuting less stressful. Every area has some location challenges. Because it’s close to two freeways, there’s a bit of noise from the highways but it’s not too bad. The other thing to know is that there’s just one road in and out, and trying to turn left from Charter Oaks Drive onto Lark Avenue can sometimes be frustrating as the cars just keep coming and there’s no traffic signal to help there. Homes in Charter Oaks are selling for about $1,100,000 to $1,200,00 as of spring 2017. (See my listing at 126 Charter Oaks Circle here.) As with every complex, some areas will sell for more than others. In this case, because the townhomes are fairly close to highway 17, some areas have road noise and will be a little less desirable. Some will have better or lesser views, access to parking, natural light, and so on. The condition and size of the unit have an enormous impact on housing values too, of course. 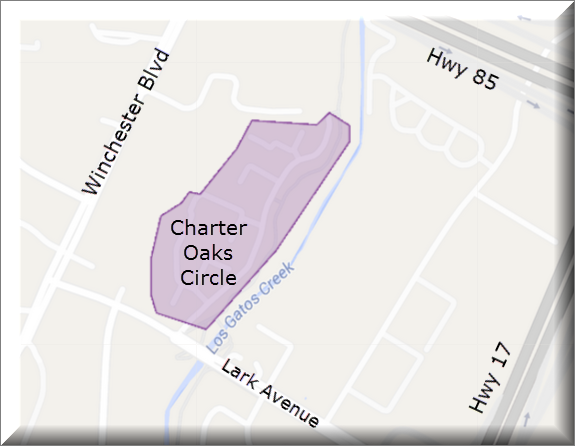 Which streets are a part of Charter Oaks? Draining a pool or spa? The water should not go to the gutter! Yesterday afternoon, my family and I walked our elderly dog through our east Los Gatos neighborhood. We saw an inordinate amount of water coming down the gutter on one street (and it was the middle of the day, so we didn’t think it was watering a lawn). Eventually we arrived at a house where a large amount of water was emerging from a property’s drainage system and into the gutter. It looked like several hoses’ worth was coming through at once. Turns out that this homeowner was draining his pool, and he didn’t know what to do with the water. So he directed it to the storm drain via the gutter. Do you know what to do with pool or spa water when it needs to be drained? I don’t think most of us do. The Town of Los Gatos has a stormwater page on its site. Here there’s a two paragraph explanation that the stormwater drainage system (what goes into the gutters) is not the same thing as the sanitary sewer system. Pool and spa water should be directed not to the gutters, but to the sewer system via either the cleanout or washer outlet. When spa or pool water is sent to the gutters, it goes to our creeks and to the bay, where it’s pollution and harmful for the environment and the ecosystem of our water. What should be done with drained pool and spa water? There had been a brochure available for more info on what to do via a link on the first page I mentioned above, but it is broken, unfortunately. I’ll contact someone at the town and if possible, will provide a working link as an update to this post when it is available.